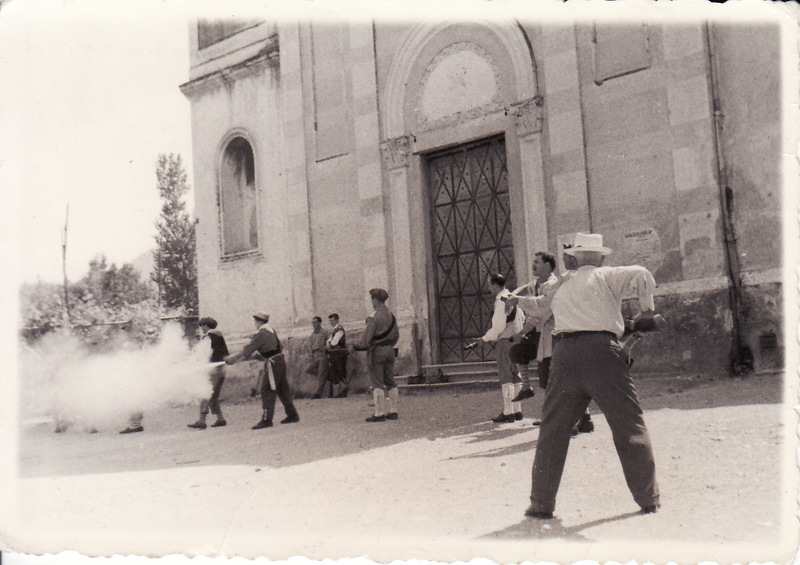 Everything started after the Second World War when on the so-called “Thursday at the Castle (Giovedì di Castello)” a cheerful company of gunmen, started from the Church of Santa Maria del Rovo in Cava de’ Tirreni, going through the near Piazza Vittorio Emanuele III (or Piazza Duomo as it is known to the inhabitants of Cava, called “Cavesi”) to finally arrive to Monte Castello. Along the road they shot and participated with devotion in the several religious functions which took place during the day. They were a large group of people in comparison to the others, especially interested in the religious aspect of the event. 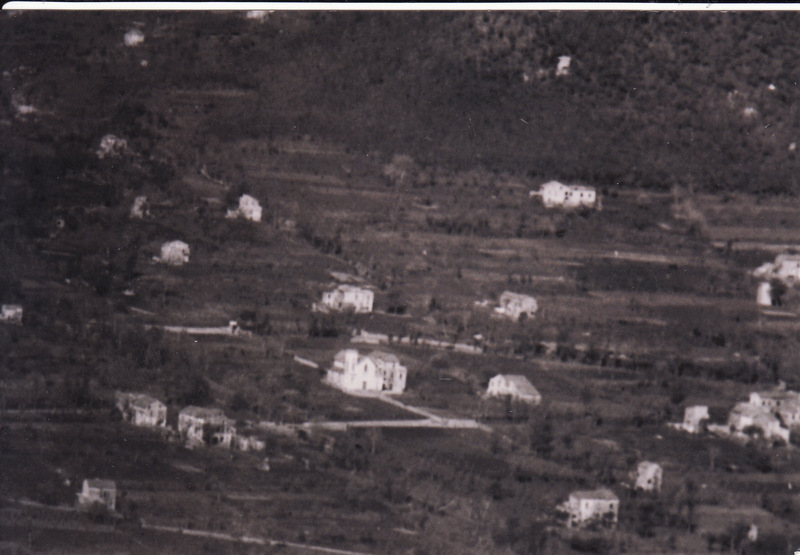 In the summer of 1975 a group of guys (Alfonso Bisogno, Andrea Sorrentino, Armando Faiella and Vincenzo Senatore), belonging to the “casale” of Santa Maria del Rovo, was woken up by a din, varied thuds which resounded through the city in a muggy afternoon. It was the din of the “pistone”, a muzzleloading firearm with smooth barrels and a caliber of about 15 and 23 mm, also called “blunderbuss” (from which derives the word “Tromboniere”). The “pistone” indicates the development of the history of Cava of the most ancient “crackle”, a kind of the local remodulation of the contemporary and the most famous arquebus, provided by the Lansquenets, German mercenaries, leaded by Charles V, who came to Cava de’ Tirreni in 1535. 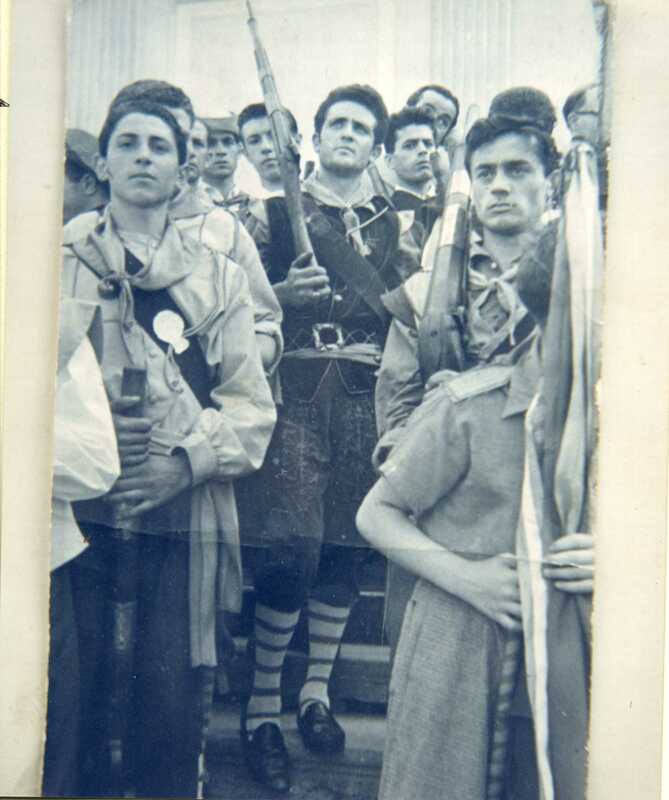 A nice man got close to them and told them old stories of certain gunmen, gathered in the name of “Madonna del Rovo” who climbed The Monte Castello for the devotion to the SS. Sacramento (Monte Castello or the Saint Adjutor Hill, a hill which overlooks Cava de’ Tirreni with the namesake castle, where the inhabitants of Cava are gathered on Thursday after the Corpus Domini for the traditional “Festa di Monte Castello”. 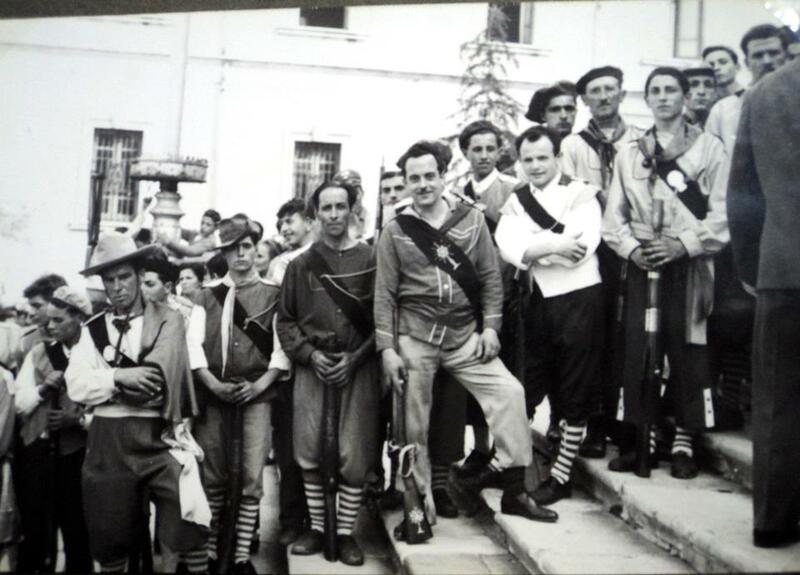 In few days those guys, animated by the desire of living these traditions, by the love for Cava and for the “Madonna di Santella”, decided to institute a group. 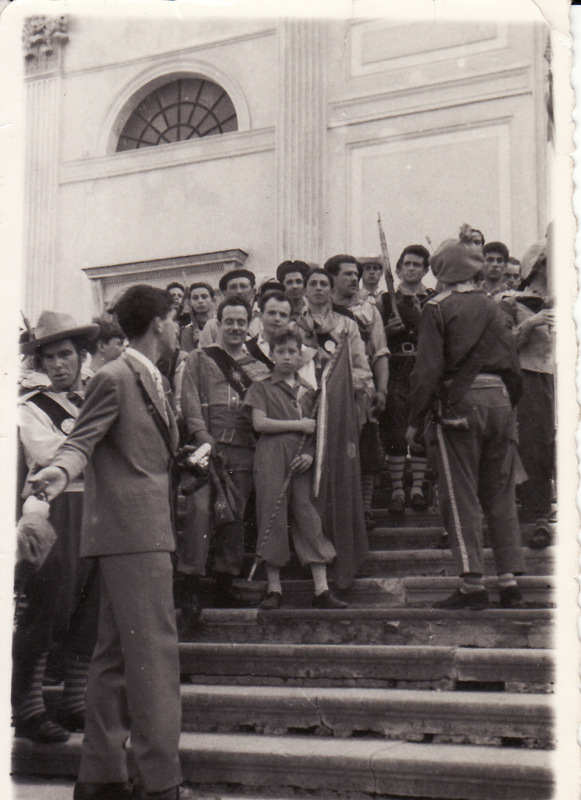 They went round throughout the district and the near suburb San Martino in search for firearms and people, who were proud of their origins and wanted to stay together and relive the history of their city. At the suggestion of Don Sabatino Apicella, parish of that period, this guys decided to adopt the social colours “white” and “green”, which were the colours of the Franciscan Brotherhood, which in the ’20s resided in Santa Maria del Rovo. Without money, but with a lot of ideas they succeeded in gathering in the Brotherhood of the Church, the first seat, and in that occasion they repainted the vault with a wonderful green background on which stood out white decorations in plaster, belonging to the end of the 19th century. They started practicing on the packs of the detergents (the “tubs of Dash”) on the rhythms that they would have played one day on the real drums. In 1980 the so-called “Pistonieri Santa Maria del Rovo” had their own statute and since then they were legally recognised. 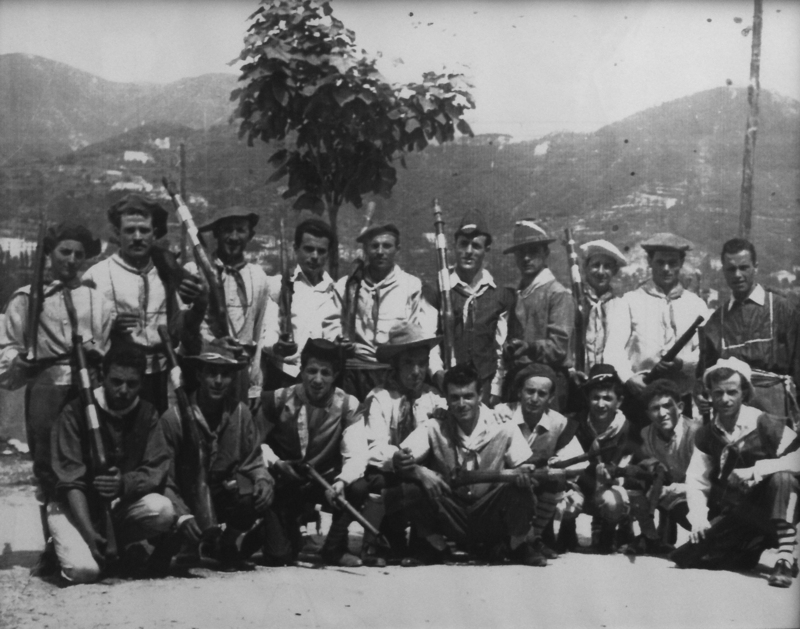 Those men decided to call their association “Pistonieri” in order to indicate a real attachment to the territory, because only in Cava exists the “Pistone”. The trainings were led by the teacher Mario Siani and later by the marshal Franco Siani. The first dresses were provided by the Ente Monte Castello (for this reason the “casale” conveys a deep gratitude to the above-mentioned company). Due to the lack of the materials available by the guys, their first flag was simply a plywood hand painted by Alfonso Bisogno. 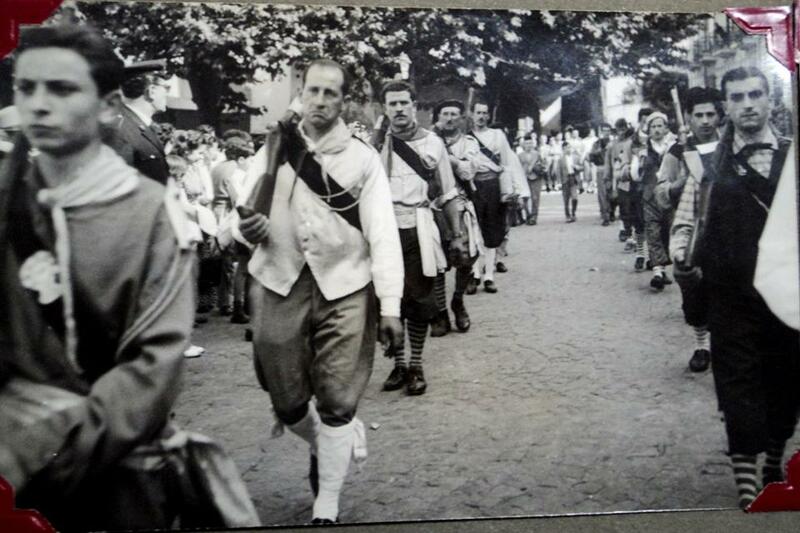 Since then, thanks to the efforts made by every single person, man or woman, young or old people, enrolled in the group or simply a sympathizer, the Pistonieri Santa Maria del Rovo became one of the best and the most important historical and folkloristic associations, in Italy and, as well as, abroad. From the north to the south of Italy, from Taormina until San Remo and touring Europe, we spread everywhere the history of our city with pride and loyalty (Fidelis et Superbia). To this day we got a lot of national and international acknowledgements, and also the appearances on prime time on the major national networks (Rai and Mediaset) are increasingly growing. This small dream has turned into reality: years of training, historical researches for the dresses (drawn in detail by Alfonso Bisogno and the most of dresses had been sewn by the tireless wives and mothers of the members with an unparalleled mastery) and music (created from the beginning by our drummers or sometimes renewed proposals of the classical music at the time), evenings and nights spent together in order to create a lot of small things, which put together form a rather unique show in the world. As time goes by, faces change, but does not the passion of those five boys, which reflects all new comers. Proud of our humble origins, we keep pursuing values of respect, union and devotion to the “Madonna del Rovo” and to the “SS. Sacramento”.